There has been a little army of 'Friend-ly' elves in the school today making up some wonderful Christmas Hampers ready for the Friend's class raffles..
Make sure you get your raffle ticket stubs returned by 12 December ready for the draw on the 15th. The Eco Council have created some beautiful rustic Christmas decorations made entirely from recycled items. These will be displayed on our tree at the Christmas Tree Festival at St Michael's Church which starts on Saturday. The Junior Road Safety Officers hosted a terrific 'Be Bright Be Seen' part of the assembly yesterday morning as part of the Suffolk Road Safe campaign. All pupils were invited to wear something 'bright' that could be seen when they are out near roads. The JRSO's handed out reflectors to all the children which they can fix onto rucksacks or zips as an added safety precaution. Every Friday lunchtime, some of the year 3 and 4 children have been improving their keyboards skills at the computer club. The children are making fabulous progress and are remembering to use their fore-fingers for the starting point on the home keys 'f' and 'j'. There haven't been too many grumbles from the children when Mrs Hall holds a piece of paper over their hands and the keyboards to really test how well they know their keys without looking. The children are amazing though and show true resilience in trying to find any keys they are unsure of. Class LH have been rewriting their own versions of Winnie the Pooh. We started off by looking at the original version by A A Milne where we examined the vocabulary he used and the way he told his story. We then practised retelling his story using actions to embed the story before we planned our own versions. In our own versions, Winnie the Pooh faced different settings which he had to negotiate; he was strolling near a volcano; he slipped on some stepping stones and in one story he was even on the Jurassic coast landing on fossils on the beach – linked to our learning in ‘Dinosaur Planet’. With a special introduction, using the storyteller’s cloak, the children then introduced their own versions of Winnie the Pooh. Each story was unique and the children used powerful vocabulary to enhance their versions of the story. The children used good expression to retell their own versions which had the class enthralled. Today, due to the bad weather, Year 6 were unable to work outside for their P.E. lesson. However, we were able to turn our misfortune into a great P.E. (dance) lesson linked to our Mexico topic, which we had planned for later on this term. The year group showed that they were able to respond to the traditional Mexican Hat Dance music and create a clear sequence of dance moves showing their understanding of telling a story through folk music, working creatively, collaboratively and enthusiastically.The "Jarabe Tapatío", better known internationally as "The Mexican Hat Dance", is a popular Mexican dance that has come to symbolize Mexico both domestically and internationally. It was great to be able to bring a little Mexican flavour to a wet Monday afternoon in Framlingham. Christmas preparations have started early in Nursery. This week the children made a HUGE Christmas cake with Mrs Eyles. Each of the children mixed their own ingredients and then they were all mixed together before putting in the great big tin to cook. The cake is safely wrapped up now, ready to be cut up to decorate and share out closer to Christmas. Doesn't it look amazing? The delicious smell filled the whole of the Foundation corridor and was enjoyed by all. We had a visit from Sharon our lollipop lady on Wednesday and chatted about how to keep safe when crossing the road. We also talked about the special bright clothes that Sharon wears and discovered that they were shiny when a light was shone on them. We all practised crossing the road, holding hands with a grown up, looking both ways, listening and waiting for when to cross, as well as walking (not running) across the road. We also talked about how important it was to keep safe around roads and cars, walking away on the pavement, away from the kerb edge. The children were very excited to see Sharon this morning recognising her from her invaluable role helping them to cross the road safely outside our school. We said a big thank you to Sharon for all she does to help keep us safe! Thank you Sharon! We weren't allowed to take any photos of the Michael Rosen performance on Wednesday, however Mrs Cann did manage to get a quick photo just before we all left the theatre. On Thursday afternoon the school participated in the HSSSP Boys Football competition at Hartismere School, Eye. 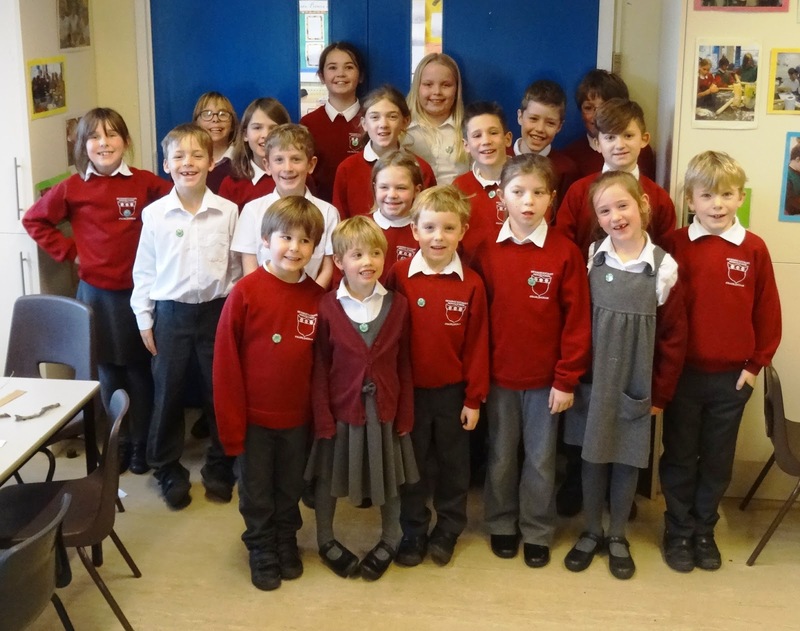 The competition featured over 25 local schools, including two teams from SRH Framlingham. Despite the adverse weather conditions all players executed their skills and strategies well and displayed noteworthy sportsmanship and excellent conduct throughout the tournament. Unfortunately the bad weather persisted and the competition was abandoned to be completed on another day. Fortunately the Framlingham 'A' team mustered enough victories to guarantee their place in the semi-finals against St Botolph's Primary School taking place at the same venue in two to three weeks time. Hopefully more positive news and results will follow shortly. Thanks to all players, parents, staff and helpers for supporting the school at this event. Thank you to Mr Byer for again taking some great 'action-shots'. On Monday, Class PLKV visited Framlingham castle and discovered clues about the site of the original motte and bailey castle, built by Roger Bigod (a Norman knight) who was given the land by William the Conqueror. We then looked at the stone castle, which replaced the motte and bailey, and identified its defences. Mrs Mawson has tucked all your teddy's up for the night! Foundation marked Remembrance Day in a number of ways. One of these was planting some special Flander's Poppy seeds together. We talked about how we wear a poppy to remember the people who died in wars for us and we all stayed silent for two minutes at 11.00. Nursery created some poppies using potato prints and poppy seeds to take home. Class CH painted some poppies for a display using finger painting and Class KM created a special Remembrance tree.